Brooks Koepka has no problem calling people out–for good reasons. Could be how the media tends to snub overlook the three-time major winner at events press conferences. Lately, he sounded off how he’s fed up with Tour slowpokes while wondering why Tour officials rule like an ostrich. GolfDigest’s Joel Beall has the details. 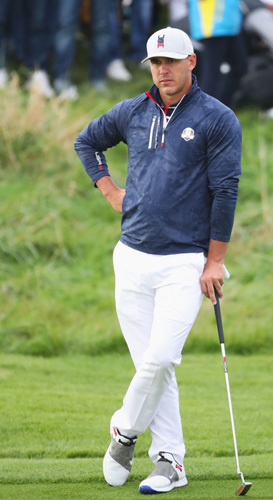 Speaking on Golf Monthly’s podcast to Michael Weston, Koepka was asked about his thoughts on the criticism DeChambeau and other players have received for slow play. The three-time major winner did not sugarcoat his response. I’ve never understood the Tour’s officials cowardly lack of tacking on penalty strokes for slow play. We all see the glacial pace and going to events live is like enduring a downright life sentence without the window dressing of TV editing. As mentioned on Monday, I’m a big fan of DeChambeau’s disruption to golf’s stodgy hierarchy. But pick up the pace sir. It really isn’t that hard–especially for a rocket scientist like yourself.